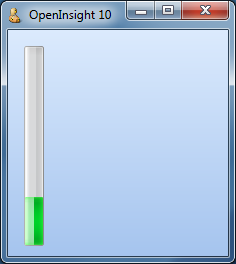 One of the new controls supported by OpenInsight 10 is the Windows Progress Bar control which is used to display the progress of lengthy operations. Setting this boolean property to TRUE (“1”) draws a border around the control. This is the default value. This property is a standard color value and sets the color of the bar when it is in the “error” state (see the STATE property below). Depending on the visual style in use this property normally defaults to a red color. This property is an integer value that contains the time in milliseconds between marquee animation updates. Setting it to 0 stops the marquee animation. This property is a standard color value and sets the color of the bar when it is in the “normal” state (see the STATE property below). Depending on the visual style in use this property normally defaults to a green color, though in other schemes like “XP Olive” this defaults to an orange color instead. This property is a standard color value and sets the color of the bar when it is in the “paused” state (see the STATE property below). Depending on the visual style in use this property normally defaults to an amber or yellow color. This property is an @fm-delimited array of two integers containing the upper and lower limits of the progress bar. 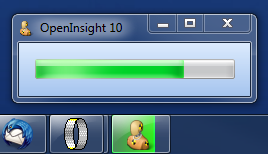 Setting this property to TRUE (“1”) will display the contents of the TEXT property in the center of the progress bar. The default is FALSE ( “0”). Setting this property to TRUE (“1”) causes the progress indicator to be drawn as a continuous bar rather than in the usual segmented style. Each of these states has a default color as indicated above but this can be changed by one of the bar color properties (NORMALCOLOR, ERRORCOLOR and PAUSEDCOLOR). This property is a simple integer and is used in conjunction with the INCREMENT method. If the latter is called with no value the progress bar is incremented by the amount specified in this property. When set to TRUE (“1”) the parent form’s taskbar button is automatically updated to mirror the state of the Progress Bar control (as per our previous post on Taskbar Integration). This property has no effect unless the application is running on Windows 7 or higher. This property is the same as the standard TEXT property. However, any occurrences of the substring “%p%” within the text will be replaced with the current percentage complete. This property specifies the transparency of the control’s background (i.e. the progress bar itself is not affected). It is based on simple percentage amount, “0″ being fully opaque and “100″ being fully transparent (and therefore not visible). This simple integer property sets the current value (position) of the progress bar. It should be a value between the limits set by the RANGE property. Setting this property to TRUE (“1”) draws the progress bar in a vertical fashion – i.e. it increments from the bottom to the top. This method decrements the progress bar by a specified amount. If no amount is specified the bar is decremented by the value contained in the STEP property instead. This method increments the progress bar by a specified amount. If no amount is specified the bar is incremented by the value contained in the STEP property instead. More information on Progress Bars can be found on the MSDN site here, along with some user interface guidelines here. This entry was posted in Presentation Server and tagged Controls, Methods, PROGRESSBAR, Properties, Taskbar on June 7, 2013 by Captain C.